So I'll freely admit that Parquet Courts can be an obtuse band to talk about. Drenched in tones half pulled from the Velvet Underground and Wire but also contorting into weird spaces with lyrics that feel socially resonant but making sense of any of them can be a real effort, the group has always skirted being a personal favourite of mine in comparison to acts pulling on similar material - think Preoccupations or Ought or even Iceage. Granted, that's not to dismiss their records - their last album Human Performance landed its title track on my top fifty favourite songs of 2016 - but I've been waiting for that moment where they really deliver. So could Wide Awake! be that moment? Reportedly the band was looking to make this a 'punk record you could put on at parties', and for production they brought in Brian Burton aka Danger Mouse, a producer with whom I have a very complicated relationship from his work with The Black Keys and Broken Bells to production he's provided The Red Hot Chili Peppers and Portugal. The Man. Suffice to say in recent years I've found his material increasingly desaturated and dreary - about the last thing I'd want to hear paired with a 'punk record you could put on at parties', but hey, this could still be pretty fun, right? Okay, honestly, I think some of this might be my fault. 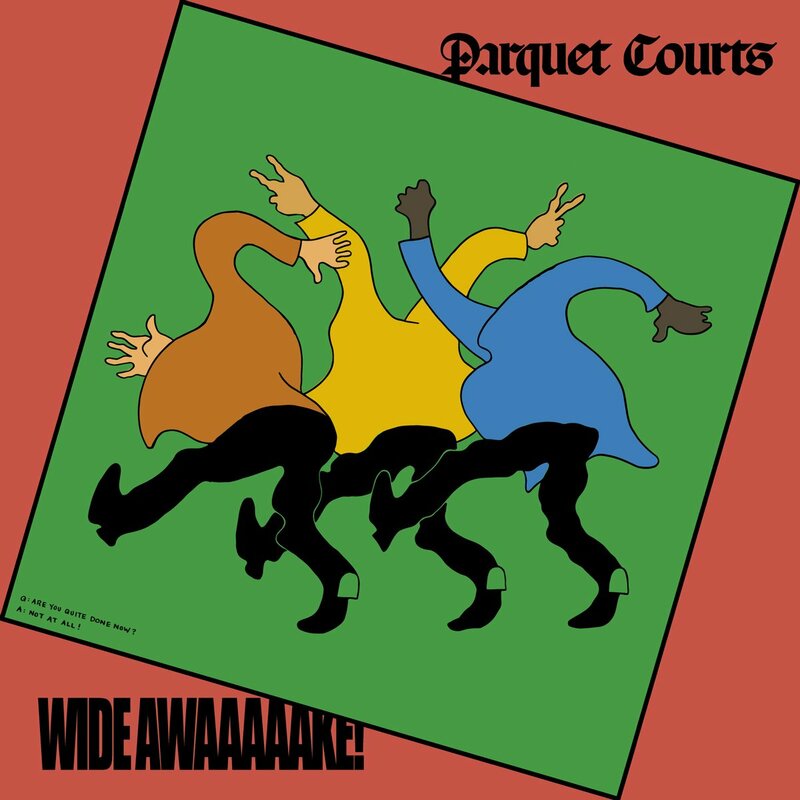 See, I won't deny that this is probably Parquet Courts most refined, sharp, literate and even accessible record to date, and for me it almost seems like it does everything right... and yet I feel like I'm not quite as excited about this as I want to be. And while some of that does tie into a larger issue with this record that I will get to - and one that if you've been following this review you can probably already guess - some of it is tied to the fact that I'm not quite as wowed by the content as many seem to be, especially in comparison to the more dense abstraction that characterized their last record. So let's start with the content, where Parquet Courts are easily attracting the most attention - because for once, you can actually figure out pretty quickly what they're talking about, where the murky abstraction of Human Performance gives way to the sort of strident and considered political statement that Pitchfork outright called 'Soviet propaganda' - because of course they did. And honestly it's a damn shame they defaulted to that language, because while Wide Awake! has a pronounced leftward slant, it's not presented in a way that distorts or misleads the audience - if anything, there's a lot more precision and nuance than you'd expect given how easy it would be for the band to default to sloganeering, with songs like 'Violence' overloaded with the sort of barking, fast-paced, detail-rich delivery from frontman Andrew Savage that recalls Minutemen circa Double Nickels On The Dime. But what's telling is that while there is a political framework surrounding many of these songs, the broader themes actually are much more balanced and more focused on the contrast between the collective and the individual. 'Total Football' is a great example of this, in highlighting how people can work together to attain a larger, deconstructive goal to dismantle established discriminatory systems while still maintaining personal autonomy - which is not contradictory, believe it or not, a collective ambition does not imply an authoritarian follow-through, and the grounding in sports metaphors does a really solid job adding texture to that language. And yet Savage is naturally something of a paranoid skeptic so he does throw jabs at the larger collectives that would seek to suborn progress, from the curdled tension at a callous mob on the right in 'Almost Had To Start A Fight / In And Out Of Patience' to how he takes calls for 'Freebird' into a sequel... that turns out to be a sensitive track about growing up with a rough childhood and trying to show fellow individuals like his put-upon mother a deeper level of compassion while realizing at some point he'd have to leave her behind to free them both of obligation. And that's a major key to this record: Savage isn't denying his individual agency and a deeply held core of optimism - which I found really charming, as he even acknowledges how he's succumbed to nihilism a few too many times - but it's really goddamn hard and lonely to be that solitary figure, especially arrayed against the constant wear and tear of systemic injustice and violence. The most blunt example comes early on with 'Violence', shredding into systemic racism, gentrification, the erasure of history, and the media's framing of revolt, and then is reflected again and again, from 'Normalization' to the endemic homelessness of 'NYC Observation', to how wearing the mask of ironic detachment can very quickly become one's reality on 'Extinction', with it being that of the self and losing individuality. But it's well-paced by the melancholic resignation of 'Mardi Gras Beads' in the relationship taken for companionship as love flickers away, to the internal processing of grief in the face of death, either of a loved one on 'Death Will Bring Change' or his own on 'Back To Earth'. So in circling back, why not work with others to bring comfort and real change, which is why 'Tenderness' is such a fantastic way to end the project: in contrast to the systemic collective denial and frightened individualism in the face of inevitable environmental calamity on 'Before The Water Gets Too High', Savage doesn't wall away emotionality, accepts the limits of his own projection as artist to the audience, and aims to embrace a larger goal, which helps soothe some of his own deeper troubles. In short, when I look at political art, even despite me hearing many of these messages before from left-wing philosophy YouTube, I can't deny that Andrew Savage distills them into a populist but nuanced picture that works to balance the contradictions as much as he could - there's definitely precision to his message. So that's two of my 'P's for great political art, populism and precision, what about power? ...well, this is where we have to talk about Brian Burton - and really, this is probably the first record in a while that he's produced I don't entirely mind what he's done. He certainly has aimed to push the band in a more complex and layered direction: basslines and grooves are far more developed and punchy, often carrying their own melody to the blend of sharp, Wire-esque guitars, organs, pianos, and even weirder tones like the Omnichord providing the drippy backdrop on 'Before The Water Gets Too High' against the dub grooves, or the pseudo-gothic swell of 'Back To Earth' with what sounds like an accordion, or what sounds like steel drums from the dancehall and funk touches of the title track. And that's not disregarding the distinctive callbacks to mid-70s funk with the thicker vocal overdubs - which was definitely an acquired taste for me but opposite the noisy guitars, organs, and killer bass groove on 'Violence' definitely wound up clicking - or the touches of dreamier 60s psychedelics that have always lurked behind Parquet Courts' nervier punk side but with arrangements like the sunshine pop of 'Mardi Gras Beads' coalesce more fully. And yet if I'm looking for a flaw on this record, it'd probably come here, and it's sadly similar to other Burton-produced records: for as good as the guitar melodies are, it's hard to avoid the feeling that with a little more scuzz and grit these songs would connect harder for me. And I fully realize this is more of a personal nitpick than normal - hell, with the more restrained production it does a lot to balance out and accentuate the nuance and Savage's more melodic delivery on several of these songs, highlight the more considered arrangements that may not have been fully appreciated with noisier releases - but I can't help but feel that the production winds up feeling a little too washed out and lacking the texture that made songs like 'Human Performance' so visceral and immediate. Oh, there are songs that get close: the punk-leaning mashup of 'Almost Had To Start A Fight/ In And Out Of Patience', the jagged noisy breakdowns of 'Normalization', the brittle melodic interplay of 'NYC Observation' that gets even faster and sharper on 'Extinction', and especially that absolutely terrific piano line on 'Tenderness'. But as a whole... look, this is a great album, and I'll freely admit that many of my hangups about expecting more edge or the politics not feeling that revolutionary are flaws of the media I've been gorging myself on recently, not of the record itself. And while Burton does not get off scot-free here, I do feel he's responsible for some of the melodic refinement and diversity on this project that I definitely respect, showing Parquet Courts leaning into their art rock side with a lot of thoughtful consideration and some ridiculously catchy songs. And like with Human Performance this album only got better with every listen, so I'm going to lean on the positive here and give it an 8/10. Definitely recommended, especially if you're looking for a more accessible entry point for Parquet Courts, and if this is coming at a point of greater popular exposure... well, all the more power to them, because this is some damn sharp indie rock, and definitely is worth your time.